The indoor relative humidity was recently 20% in my study where I keep my guitars. The good news is my guitars are inside my humidified guitar storage cabinet where the humidity is over 40%. So why am I unhappy about the humidity? Keeping your solid top acoustic and hollow body electric guitars (and other instruments) humidified is difficult. There are two major problems and neither is easily solved in spite of the fact that conceptually the solution seems simple. Problem 1: Measuring the humidity. If you aren’t sure what the humidity is then you won’t be able to take the correct action to protect your musical instruments. 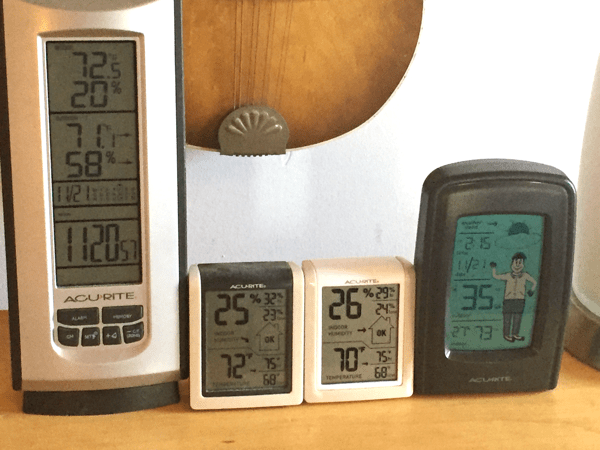 The obvious and simple solution is to purchase a digital hygrometer (i.e., a ‘humidity gauge’) and place it where you store your guitars. If you own only a single gauge and don’t think about calibration you may be lulled into believing the numbers on the gauge are accurate. They may have been when the device was new — but not necessarily. However these devices can drift with time. The sensors can get dirty and affect the reading. If you have more than one humidity measuring device you may discover as I once did that the two reading differ by a large amount. I once had one hygrometer differ by more than 10% from another. One device might read 40% (good humidity for guitars) and the other 30% (a not so good humidity for guitars or humans). Which one do you trust, if either? See my other articles regarding humidity here. I’ve written about methods to calibrate your humidity gauges. But most consumer digital hygrometers can’t actually be calibrated, only checked. If my hygrometers still seem to respond to dry and humid conditions I’ll just make a note of how much off the reading is from the calibrated value. Temp and Humidity from 4 devices. Left shows 72 deg and 20% RH (top reading for indoor); Left-center shows 72 deg abd 25% RH; Right-center shows 70 deg and 26% RH; Right shows 73 deg and 27% RH. Note that the second set of readings on the left most device are for inside my guitar cabinet where the readings are 71 deg and 57% RH. Problem 2: Controlling the humidity. Let’s assume you know the actual relative humidity accurately enough to know it is too dry for you guitar. Now what? Getting the humidity back up to an acceptable range is as difficult as knowing what the humidity is. The image shown above indicates the relative humidity inside my guitar cabinet is 58%. That’s too high, if it’s accurate, which it might not be. Presuming I believe it is accurate, I can turn off the fan that blows over my water saturated sponges or I can crack the door to the cabinet. There are better ways to control the humidity than a homemade cabinet humidifier. But they depend on having a sealed, closed, small space to be humidified. In other words, they are designed to be used in your guitar case. I’ve reviewed these before as well. The humidipak system will actually remove humidity from the air if it is too humid. But it would require a lot of those packs to humidify my cabinet and that’s assuming I made the cabinet airtight. Do I recommend we all just give up? NO! The truth is I’m just sharing my frustrations with you. This is difficult for anyone who has nice guitars and wants to protect them. It is as difficult for me as for you. So the first thing to remember, it is better to do the best you can than it is to do nothing. If you haven’t calibrated your humidity measurement device but you have replaced the batteries, you’re better off than having no idea that it might be too dry. If you can’t accurately control the humidity to a range of 40% to 50% RH you are at least keeping the humidity from dropping to 15%. Guitars and people both prefer about 40% RH or a range of 40% to 50% RH but you and your guitars are likely to survive outside this range. The important thing is you are preventing long term exposure of your guitars to extremely low humidity. However, I recommend you check your hygrometers from time to time and think about too high as well as too low humidities. Good luck. I’ve got to go turn off the fan in my guitar cabinet — the humidity is too high.